Two spacewalking astronauts are hunting for an ammonia leak outside the International Space Station today (May 11) in the hopes of bringing the outpost's vital cooling system back up to full strength. Clad in bulky spacesuits, NASA astronauts Chris Cassidy and Tom Marshburn floated outside the space station at 8:44 a.m. EDT (1244 GMT), beginning what officials have described as a six-hour detective's investigation in orbit to find - and hopefully fix - the ammonia coolant leak. The space station uses liquid ammonia as a vital coolant to keep its systems cool. 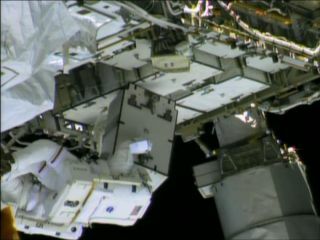 You can watch the spacewalk live here on SPACE.com via NASA TV. The ammonia leak was first spotted by space station astronauts on Thursday (May 9), when the crew reported seeing flakes of frozen coolant floating outside. They recorded video of the ammonia leak and sent it down to Mission Control for analysis, leading to today's emergency spacewalk to search for the leak. It is the fastest spacewalk plan of its kind ever devised for a space station crew, mission managers have said. The primary goal of today's spacewalk is to inspect the suspect ammonia pump control box for any signs of damage or leaks. The box is one of several on the space station's far left segment, known as the Port 6 truss. It is part of the cooling system for the two wing-like solar arrays extending from the Port 6 segment. While the leak poses no danger to the space station's crew, if it goes unchecked it could impact the amount of power available for daily operations on the orbiting laboratory, mission managers have said. If Cassidy and Marshburn find definite evidence of the ammonia leak in the pump box, they can replace the box with a spare stored on the truss segment. If no leak is found, they will re-install the original pump control box and return inside the space station, NASA officials have said. So far, however, the spacewalkers have found no obvious signs of ammonia leaking from the pump control box. "I can't think of anything to tell you other than nominal," Cassidy said as he described what he was seeing at the pump control box's location. The two astronauts will also take extra care of their spacesuits while working near the ammonia pump control box. They have brushes and other tools to clean the spacesuits of any toxic ammonia flakes that may stick to them, and can perform a "bake out" to allow any ammonia to evaporate in sunlight, if needed.